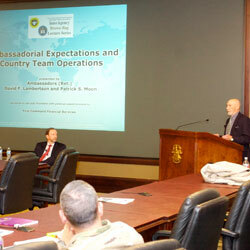 Retired Ambassadors David Lambertson and Patrick Moon gave the latest presentation in the InterAgency Brown-Bag Lecture Series, speaking about Ambassadorial Expectations and Country Team Operations on April 3. During their presentation Ambassadors Lambertson and Moon shared their experiences on Embassy Country Teams and discussed an Ambassador’s expectations of U.S. personnel and how Country Teams are structure and operate. Moon served as the U.S. Ambassador to Bosnia and Herzegovina from 2010 to 2013, and served as the Civilian Deputy to the Commander of U.S. European Command (EUCOM) from 2013 to 2015. During his presentation he discussed how he guided his team, including a mission statement that he wrote and distributed to the agencies that made up his team. Moon also talked about his work at EUCOM, which included facilitating interagency briefings that brought together agency leaders and ambassadors to learn about EUCOM’s role and the scope of what EUCOM was able to do. This was the eighth presentation in the series, which is co-hosted by the CGSC Foundation’s Simons Center with the U.S. Army Command and General Staff School (CGSS). The InterAgency Brown-Bag Lecture Series is an extracurricular, interagency topic-focused series that is intended to help enrich the CGSS curriculum. 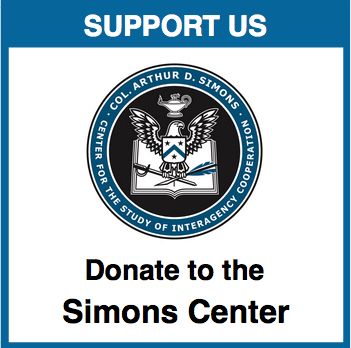 The CGSC Foundation and the Simons Center have received support for all brown-bag lectures in academic year 2018 from First Command Financial Services in Leavenworth, Kansas. The presentations are scheduled each month, and a schedule for future InterAgency Brown-Bag Lectures can be found here. The next lecture is May 8 and will feature a presentation on the domain of Space and the challenges and opportunities in the national security realm it provides. 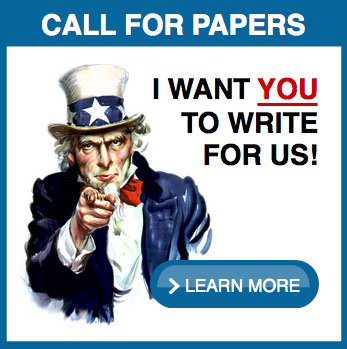 the U.S. Army Command and General Staff College.